I have a confession to make. Like many of you reading this, I have a list of games that I’ve been meaning play for years. I have way too many games on Steam, and a stack of cases sitting next to my TV. Close to five hundred games now. Maybe more. It makes me feel guilty. I haven’t touched 90% of them in one way or another. I need to fix that. So this week, I dug deep into my backlog and pulled out a game. I want to play all of them; I’ve just never had the chance. Now’s the time. I never thought I would play a game whose sole job was making me clean a room. As I played, I sat at a desk that was littered with pens, coffee mugs, paper, headphones, ink, and computers, wondering what the hell I was doing. I sent two hours picking up individual shotgun shell cases before laboriously mopping up blood spatter and organizing Christmas gifts on a table. 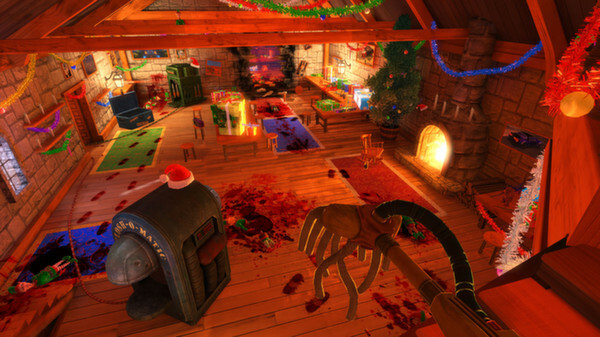 In the spirit of the season I tackled Viscera Cleanup Detail: Santa’s Rampage this week. And as I piled tiny dead bodies into a roaring fireplace with a jaunty Christmas tune playing in the background, a felt a surge in my holiday spirit. They did a damned good job at making a version of Santa’s workshop that felt believable without being too big to handle. The place is a mess, practically destroyed, and as you wade through the gore you realize how big of a job that is actually in front of you. This is one of those weird games that I still can’t remember how I got, considering it is just a stand alone level for the Viscera Cleanup Detail main game. You take the role of a janitor that works for a company that specializes in tidying up after massacres. The game is essentially an interactive, explorable picture hunt where you painstakingly search the environment for every last drop of blood and forgotten weapon. Finding a tiny elf hand hiding behind a box of Christmas presents has never been more fun. It doesn’t sound like it should be at all, and there were a few moments as I ran boxes of gore back and forth that I wondered what in the hell that I was doing. Why was I playing a game about cleaning instead of cleaning my room or my office like I probably should? Somehow the game managed to hold my attention for the few hours that I played, with something satisfying about fixing the disorder, erasing the horrific incident that had occurred. It is a simple game. You have the one area to cleanup, and when you are done, you leave. There is little variety to the way you cleanup the place, and the few times that I played all felt the exact same. I preferred burning everything that wasn’t nailed down for maximum cleanliness, and reading the notes from the selfish kids gave me a good laugh before I tossed their presents in the fire. It’s a good way to while away a few hours on a cold evening with a nice cup of tea, but the game lacks any real sort of depth. It is a strange title, surreal even. And intentionally so. The kind of game you want to show your friends but never explain how you found it. The kind of game you don’t want anyone to catch you playing, because then you would have to explain why you were carrying around a bucket full of severed elf heads. But you know what you are getting into when you start, and it never really becomes anything more. Tom has been writing about media since he was a senior in high school. He likes long walks on the beach, dark liquor, and when characters reload guns in action movies.